Zoe’s Bat Mitzvah Garden is Planted in Tipitapa! During our February 2016 trip, U.S. youth delegate Zoe Sepsenwol learned that wells are protected when they have trees around them. Her father, Jonathan Sepsenwol, and his friend, David Haber, had supported the upgrading of a water source in one of Tipitapa’s poorest settlements. 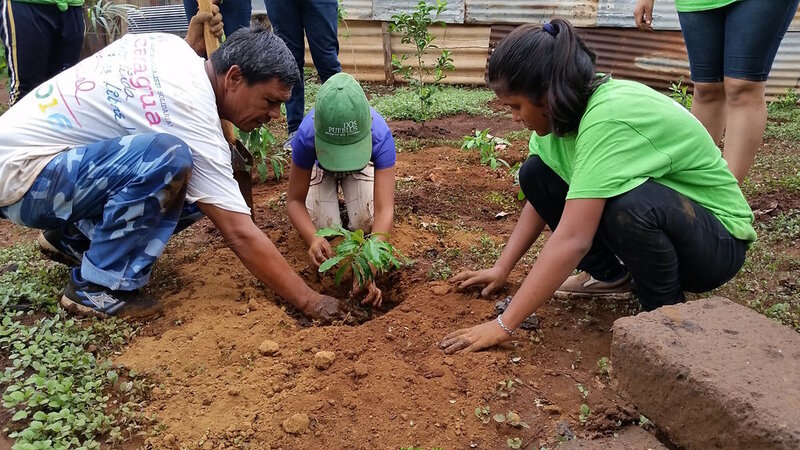 Zoe became determined to follow up after she returned from Nicaragua by raising $500 for her Bat Mitzvah and donating it for planting fruit trees and other soil- and water-protective plants around the well in the Marvin Salazar community. 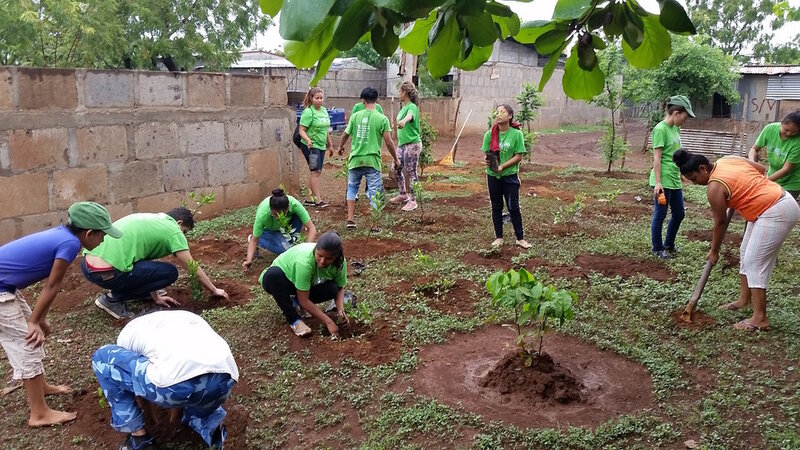 With know-how and labor from community members and the Arco Iris youth team, our Nicaraguan partners waited until the rainy season started in May, the right time for planting. Look at the results! The entire Arco Iris team chipped in to plant 18 citrus trees and 18 banana and palm trees. Among the clusters of plants are 18 citrus trees and 18 banana and palm trees. The Nicaraguans are thrilled with the idea that 18 signifes “life” in the Jewish tradition, as water is truly a source of life. The project nicely complements our theme of cross-cultural communication about religious traditions this year. I visited the community in February 2017 before this year’s delegation arrived, and saw once again how this water project has made an enormous difference in the lives of the people in this community with very limited resources. Another exciting aspect of this project is a new collaboration with the Arco Iris team. Joselyn Urbina Corea, an Arco Iris teen, has been active in gardening and tree- planting both at the Dos Pueblos library in Chilamatillo and at her high school. She saw Zoe’s project as an opportunity to take on additional responsibilities, so she is using her gardening skills and growing tremendously as a leader through this project. We’re so proud of the hard work and accomplishments of both of these young women! Joselyn (right) helps oversee Zoe's reforestation project in Marvin Salazar. Ann is a longtime supporter and former chairperson of the Dos Pueblos board. She currently serves as the board secretary.